It's been a long time since I tried white water rafting. Back in my young, fit days I did it a few times. The first was in Zimbabwe on the Zambezi river (see photo) and that was pretty scary! I also did easier (but colder) rafting trips in Chile and Wales. And here in Thailand we've tended to shy away from tourist activities, preferring to find our own adventures, but sometimes we certainly do what the tourists do, I mean you have to visit Phi Phi and James Bond Island and see the Fantasea show and so on, there are some "must see" things around here! To the north of Phuket you have Phang Nga province, which we visit often. It's a huge area with a lot to see, and even this year we have done several trips exploring roads that were new to us, including the Klong Kian area and the Tone Pariwat Waterfall. Along the road to this waterfall, which followed a river, we saw many rafting companies and lots of elephants (for elephant trekking). 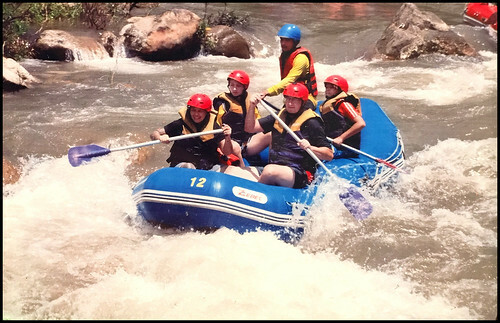 So last week when our friends who run the Easy Day Thailand tour company asked us to join a fun "company trip" including rafting and a night in Khao Lak, we knew where to go and looked forward to another drive in that direction. very nice scenery around there. It's only about a 90 minute drive from where we live near Phuket Town - out of Phuket, over the bridge, to Phang Nga Town and then about another 15km after the town. And we got lucky with the low season weather which during July and early August had seen plenty of wind and rain. On Saturday August 15th the weather was beautiful. We reached the "Best Rafting 4U" headquarters about 9:30am and had time to get some coffee, take a little walk by the river and wait for the whole group to arrive in dribs and drabs. (above) The river next to the rafting camp. Not very rough! You see .. further upstream is a dam, which is opened when all the rafts (from various companies) are ready to go, this increases the river flow and makes things more fun :) In extreme weather the river itself can overflow the dam, and rafting can't be done. It did seem pretty safe to me, nothing too scary if you have done it before. 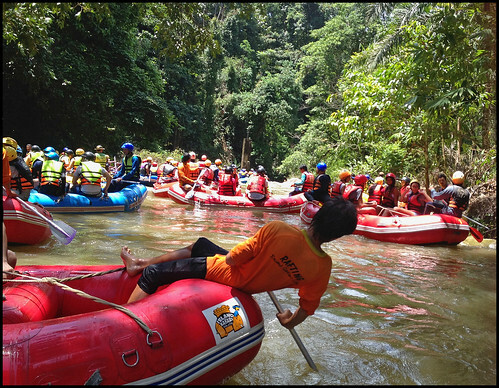 Quite scary for my 10 year old boy :) I have read over the years of at least one death on a rafting trip, but not sure if that was here or in Khao Sok national park. We all had to wear helmets and lifejackets on the rafts, and it was plenty of fun, but in our group there were kids as young as 5, so I think that is a measure of the danger factor. Actually I am not sure if they generally allow kids that young, but as we were a big "travel agent" group, I guess any such rule was waived. So we were driven in trucks a few km up river to "the dam" where rafts were launched down a slide and we walked down stairs to the water, and then had to exit the raft again 20 meters later and clamber over rocks to get to the actual river. And then wait for the dam to be opened .... Before this, a briefing was given explaining how to sit in the raft, to listen to the guide on the raft and what to do should we fall out! Rafts could hold 4 - 5 people. So we took a raft for our family of 4. (above) Rafting family ready to go! (above) Launching a raft into the calm water above the dam. Actually the hardest part of the trip for big, clumsy me was climbing over rocks to get back into the raft just below the dam. This dam is not huge, but holds the water about 5m higher than the river below, so once they open it, there is quite a rush! Our rafts waited until the water was high enough and then set off pretty darn fast! They do recommend not taking phones or cameras. We took an older iPhone and had a dry bag. The photo above (my boy and me) was taken as we started moving. I think, in hindsight, I could have taken a nicer camera in the dry bag and snapped photos between rougher sections of river, but this is ideal GoPro camera territory, or any small waterproof camera. My helmet even had some kind of mount built in. A selfie stick with a GoPro - even better :) But I can't stand people who, instead of enjoying something, are constantly taking their own picture, so they can enjoy watching themselves later. Enjoy the NOW! And as the rafting company takes photos as you head down the river which they will frame and sell you later for 200 Baht, you will get a good action shot of yourself! (above) That's us! 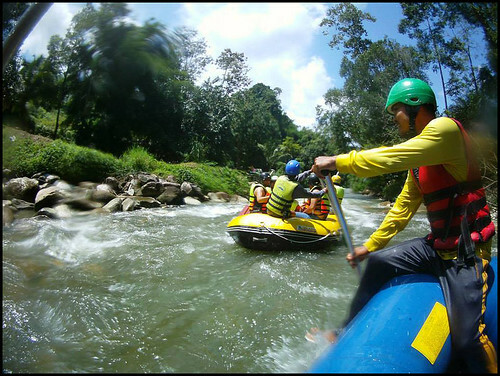 Photo taken by the rafting company. Looks quite rough actually .. 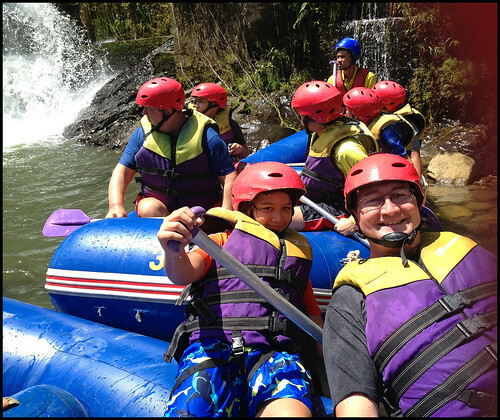 I guess there were a few little sections that had me falling over backwards in the raft and nearly squashing my son! The whole rafting experience was over in about 30 minutes. I am sure they told us it was a 5km ride, but if I look on Google Earth, looks like about half of that. And at times as we rushed down rapids and into calmer areas, it did seem surprisingly crowded, especially as this is low season. There were rafts from several different operators at the same time. Although - when I say "low season", it's probably the best time for rafting. If you try this in a dry February, the river might have low water levels/ Now, after some rain, it was just about perfect. (above) A busy low season day on the river! We finished our rafting right next to the BestRafting4U camp, where they have some decent bathrooms, so we could change, dump wet clothes in our cars, and they provided a big buffet lunch. 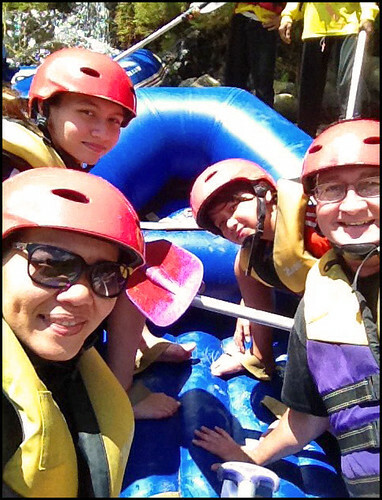 We were just here for rafting, as the weekend was to be combined with a relaxing stay in Khao Lak (about 50 km to the west). Most people would sign up for combination adventure tours with rafting, visiting the waterfall, maybe elephant riding, ATV rides, jungle zip-lining, there are several options - you can ask our friends at Easy Day Thailand about these trips. 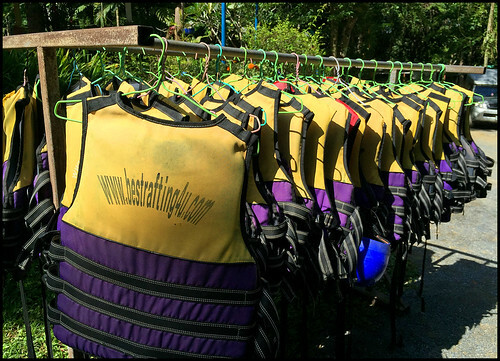 We just came for a bit of whitewater fun, and then headed off for some time by the pool in Khao Lak at The Leaf On The Sands Resort.